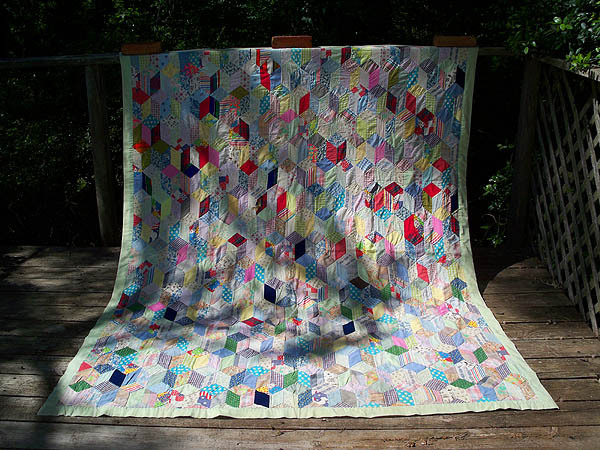 This is the first quilt I ever completed… mostly because I thought I was going to die. When my son was born in 1978, I became deathly ill and was eventually diagnosed with Myasthenia Gravis. No doctor would give me a straight answer as to whether I would live or die so I decided I better hurry and make a quilt for my son so he would have something to remind him of the love his dead mother felt for him. I began the quilt in early 1979. I was too weak to use scissors (or swallow or smile for that matter) but with the little money we had, Bob bought electric scissors, a super marked-down ugly dijon mustard-colored blanket (for batting) and a mint green sheet (backing). The electric scissors worked well through this one quilt before they bit the dust. I already had lots of scraps from garment sewing so I made cardboard templates and proceeded to make this quilt. Thank goodness for this quilt! It helped serve as a distraction to my illness and added to my determination to live, at least until it was finished. This altered Tumbling Blocks (block sides are different size from the tops) is entirely hand pieced and hand quilted with ‘5 spools for $1’ polyester thread (the only thread I could afford). The quilt has been much loved and washed many dozens of times. It has survived, as have I.